Summer heat can make some plants wish for spring or autumn, but there are some wonderful flowering plants that will continue to burst into bloom even in the heat of July. Buddleia or “Miss Molly,” sometimes called a butterfly bush or summer lilac is a lovely compact plant that has sterile owers so the butterflies and other pollinators will enjoy the nectar but the plant will not toss seeds all over the garden. “Miss Molly” has fragrant red to magenta flowers that form a cone of color from mid-summer until the first hard frost. The warmer temperatures of the summer, the darker the flowers — giving the plants offer a calliope of color from a dark purple red to a lighter magenta or even pink. The plants will attract many pollinators including butterflies and hummingbirds but deer will not nibble. Many butterfly bushes will grow 10-15 feet tall. However, “Miss Molly” grows up to a compact plant 4-5 feet tall if planted in full sun. Flowers are only formed on new growth, so pruning back the plant to about one foot tall in the early spring will ensure that lots of new branches, and lots of beautiful fragrant owers will follow. 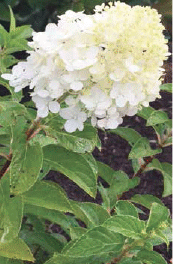 For the best owering, plant “Miss Molly” in full sun and in moist but well drained fertile soils. Then, sit back and enjoy the arching branches topped with beautiful flowers that are surrounded by colorful butterflies and humming birds.